Trauma is the leading cause of morbidity and mortality in the pediatric population. The abdomen is the third most commonly injured anatomic region in children, after the head and the extremities. Abdominal trauma can be associated with significant morbidity and may have a mortality as high as 8.5%. The abdomen is the most common site of initially unrecognized fatal injury in traumatized children. Management of abdominal injuries in children has evolved considerably. It has been shown that nonoperative treatment of children with blunt abdominal trauma is successful in more than 95% of appropriately selected cases if trauma care providers have a thorough knowledge of the anatomy and physiology of the growing child. This article reviews the typical presenting signs, evaluation, and treatment of children with suspected abdominal injuries following trauma. For more information, see Abdominal Vascular Injuries,Penetrating Abdominal Trauma,Blunt Abdominal Trauma and Focused Assessment with Sonography in Trauma (FAST). For patient education resources, see the Wounds Center, the Trauma Resource Center, and the Children’s Health Center, as well as Puncture Wound and Bruises. Unique pediatric aspects of the anatomy and physiology of the abdomen contribute to the abdomen’s biomechanical response to traumatic loads. The solid organs are comparatively larger in the child than in the adult; therefore, more surface area is exposed, making the organ more at risk for injury. A lower fat content and more elastic attachments are typical of the intra-abdominal organs in children. These characteristics reduce the amount of energy absorption and may result in increased motility and vulnerability (eg, kidneys). The child’s spleen has a thicker capsule than that of the adult, yet the spleen is among the most commonly injured solid organs in blunt abdominal trauma. In the young child, the intestine is not fully attached within the peritoneal cavity (especially the sigmoid and right colon), and this incomplete attachment potentially makes it more vulnerable to injury from sudden deceleration or abdominal compression. The bladder extends to the level of the umbilicus at birth and therefore is more exposed to a direct impact to the lower abdomen. With age, the bladder descends to its retropubic position. The rapid growth of the spine during adolescence influences its anatomy and biomechanical properties, particularly in the lumbar area. In a child with a thin abdominal wall and who is poorly restrained (lap belt only), the fulcrum of a flexion injury would be at the body of the spine, which exposes it to a flexion-distraction injury (Chance fracture). More than 80% of traumatic abdominal injuries in children result from blunt mechanisms; most commonly, they are related to motor vehicle accidents. Abdominal injuries may also result from falls or direct blows to the abdominal wall (eg, handlebar injury; see the image below). Abdominal wall findings from handlebar injury. In the United States, firearm injuries are by far the most common cause of penetrating wounds. Other causes of penetrating injuries include stab wounds, impalements, dog bites, and machinery-related accidents. Traumatic injuries continue to be the leading cause of death in children, far surpassing other causes in frequency. Abdominal trauma accounts for 8-10% of all trauma admissions to pediatric hospitals. Penetrating injuries are less common in children and account for 8-12% of pediatric abdominal trauma admissions in most trauma centers. Nonoperative treatment of children with blunt abdominal trauma is successful in more than 95% of appropriately selected cases if trauma care providers have a thorough knowledge of the anatomy and physiology of the growing child. The abdomen is injured in 25% of children with GSWs; of these wounds, 14% are fatal. Out of all forms of pediatric abdominal trauma, abdominal trauma secondary to assault or abuse is associated with the highest mortality. Abdominal trauma related to child abuse also carries a particularly high risk of hollow-viscus injury. Schmidt B, Schimpl G, Hollwarth ME. Blunt liver trauma in children. Pediatr Surg Int. 2004 Dec. 20(11-12):846-50. [Medline]. Stylianos S. Evidence-based guidelines for resource utilization in children with isolated spleen or liver injury. The APSA Trauma Committee. J Pediatr Surg. 2000 Feb. 35(2):164-7; discussion 167-9. [Medline]. Clark P, Letts M. Trauma to the thoracic and lumbar spine in the adolescent. Can J Surg. 2001 Oct. 44(5):337-45. [Medline]. Cooper A, Barlow B, DiScala C, String D. Mortality and truncal injury: the pediatric perspective. J Pediatr Surg. 1994 Jan. 29(1):33-8. [Medline]. Nance ML, Sing RF, Branas CC, Schwab CW. Shotgun wounds in children. Not just accidents. Arch Surg. 1997 Jan. 132(1):58-61; discussion 62. [Medline]. Hobbs CJ. Abdominal injury due to child abuse. Lancet. 2005 Jul 16-22. 366(9481):187-8. [Medline]. Advanced Trauma Life Support. American College of Surgeons. Available at https://www.facs.org/quality-programs/trauma/atls. 2017; Accessed: September 21, 2017. Stylianos S, Egorova N, Guice KS, Arons RR, Oldham KT. Variation in treatment of pediatric spleen injury at trauma centers versus nontrauma centers: a call for dissemination of American Pediatric Surgical Association benchmarks and guidelines. J Am Coll Surg. 2006 Feb. 202(2):247-51. [Medline]. Tataria M, Nance ML, Holmes JH 4th, et al. Pediatric blunt abdominal injury: age is irrelevant and delayed operation is not detrimental. J Trauma. 2007 Sep. 63(3):608-14. [Medline]. Rothrock SG, Green SM, Morgan R. Abdominal trauma in infants and children: prompt identification and early management of serious and life-threatening injuries. Part I: injury patterns and initial assessment. Pediatr Emerg Care. 2000 Apr. 16(2):106-15. [Medline]. Rothrock SG, Green SM, Morgan R. Abdominal trauma in infants and children: prompt identification and early management of serious and life-threatening injuries. Part II: Specific injuries and ED management. Pediatr Emerg Care. 2000 Jun. 16(3):189-95. [Medline]. Stafford PW, Blinman TA, Nance ML. Practical points in evaluation and resuscitation of the injured child. Surg Clin North Am. 2002 Apr. 82(2):273-301. [Medline]. Stafford PW, Nance ML. Managing pediatric solid organ injury. J Am Coll Surg. 2002 Mar. 194(3):394-5. [Medline]. Wright MS. Update on pediatric trauma care. Curr Opin Pediatr. 1995 Jun. 7(3):292-6. [Medline]. Taylor GA, Kaufman RA, Sivit CJ. Active hemorrhage in children after thoracoabdominal trauma: clinical and CT features. AJR Am J Roentgenol. 1994 Feb. 162(2):401-4. [Medline]. Lim-Dunham JE, Narra J, Benya EC, Donaldson JS. Aspiration after administration of oral contrast material in children undergoing abdominal CT for trauma. AJR Am J Roentgenol. 1997 Oct. 169(4):1015-8. [Medline]. Strouse PJ, Close BJ, Marshall KW, Cywes R. CT of bowel and mesenteric trauma in children. Radiographics. 1999 Sep-Oct. 19(5):1237-50. [Medline]. Shankar KR, Lloyd DA, Kitteringham L, Carty HM. Oral contrast with computed tomography in the evaluation of blunt abdominal trauma in children. Br J Surg. 1999 Aug. 86(8):1073-7. [Medline]. Fang JF, Chen RJ, Wong YC, et al. Pooling of contrast material on computed tomography mandates aggressive management of blunt hepatic injury. Am J Surg. 1998 Oct. 176(4):315-9. [Medline]. Acker SN, Stewart CL, Roosevelt GE, Partrick DA, Moore EE, Bensard DD. When is it safe to forgo abdominal CT in blunt-injured children?. Surgery. 2015 Aug. 158 (2):408-12. [Medline]. Nellensteijn DR, Greuter MJ, El Moumni M, Hulscher JB. The Use of CT Scan in Hemodynamically Stable Children with Blunt Abdominal Trauma: Look before You Leap. Eur J Pediatr Surg. 2015 May 27. [Medline]. Streck CJ, Vogel AM, Zhang J, Huang EY, Santore MT, Tsao K, et al. Identifying Children at Very Low Risk for Blunt Intra-Abdominal Injury in Whom CT of the Abdomen Can Be Avoided Safely. J Am Coll Surg. 2017 Apr. 224 (4):449-458.e3. [Medline]. Coley BD, Mutabagani KH, Martin LC, et al. Focused abdominal sonography for trauma (FAST) in children with blunt abdominal trauma. J Trauma. 2000 May. 48(5):902-6. [Medline]. McGahan JP, Richards J, Gillen M. The focused abdominal sonography for trauma scan: pearls and pitfalls. J Ultrasound Med. 2002 Jul. 21(7):789-800. [Medline]. Kennedy C, Kempf J. FAST exams in pediatric abdominal trauma. Acad Emerg Med. 2002. 9(5):519. McGahan PJ, Richards JR, Bair AE, Rose JS. Ultrasound detection of blunt urological trauma: a 6-year study. Injury. 2005 Jun. 36(6):762-70. [Medline]. Baka AG, Delgado CA, Simon HK. Current use and perceived utility of ultrasound for evaluation of pediatric compared with adult trauma patients. Pediatr Emerg Care. 2002 Jun. 18(3):163-7. [Medline]. Ben-Ishay O, Daoud M, Peled Z, Brauner E, Bahouth H, Kluger Y. Focused abdominal sonography for trauma in the clinical evaluation of children with blunt abdominal trauma. World J Emerg Surg. 2015. 10:27. [Medline]. Holmes JF, Kelley KM, Wootton-Gorges SL, Utter GH, Abramson LP, Rose JS, et al. Effect of Abdominal Ultrasound on Clinical Care, Outcomes, and Resource Use Among Children With Blunt Torso Trauma: A Randomized Clinical Trial. JAMA. 2017 Jun 13. 317 (22):2290-2296. [Medline]. Calder BW, Vogel AM, Zhang J, et al. Focused assessment with sonography for trauma in children after blunt abdominal trauma: A multi-institutional analysis. J Trauma Acute Care Surg. 2017 Aug. 83 (2):218-224. [Medline]. Krausz MM, Abbou B, Hershko DD, et al. Laparoscopic diagnostic peritoneal lavage (L-DPL): A method for evaluation of penetrating abdominal stab wounds. World J Emerg Surg. 2006 Mar 24. 1:3. [Medline]. [Full Text]. Willmann JK, Roos JE, Platz A, et al. Multidetector CT: detection of active hemorrhage in patients with blunt abdominal trauma. AJR Am J Roentgenol. 2002 Aug. 179(2):437-44. [Medline]. Gaines BA, Rutkoski JD. The role of laparoscopy in pediatric trauma. Semin Pediatr Surg. 2010 Nov. 19(4):300-3. [Medline]. Marwan A, Harmon CM, Georgeson KE, Smith GF, Muensterer OJ. Use of laparoscopy in the management of pediatric abdominal trauma. J Trauma. 2010 Oct. 69(4):761-4. [Medline]. Ameh EA, Nmadu PT. Gastrointestinal injuries from blunt abdominal trauma in children. East Afr Med J. 2004 Apr. 81(4):194-7. [Medline]. DiScala C, Sege R, Li G, Reece RM. Child abuse and unintentional injuries: a 10-year retrospective. Arch Pediatr Adolesc Med. 2000 Jan. 154(1):16-22. [Medline]. Mezhir JJ, Glynn L, Liu DC, Statter MB. Handlebar injuries in children: should we raise the bar of suspicion?. Am Surg. 2007 Aug. 73(8):807-10. [Medline]. Nayci A, Stavlo PL, Zarroug AE, Zietlow SP, Moir CR, Rodeberg DA. Snowmobile injuries in children and adolescents. Mayo Clin Proc. 2006 Jan. 81(1):39-44. [Medline]. Shapiro MB, Nance ML, Schiller HJ, Hoff WS, Kauder DR, Schwab CW. Nonoperative management of solid abdominal organ injuries from blunt trauma: impact of neurologic impairment. Am Surg. 2001 Aug. 67(8):793-6. [Medline]. Eichelberger MR, Randolph JG. Thoracic trauma in children. Surg Clin North Am. 1981 Oct. 61(5):1181-97. [Medline]. Kaya SO, Karabulut N, Yuncu G, Sevinc S, Kiroglu Y. Sinus cut-off sign: a helpful sign in the CT diagnosis of diaphragmatic rupture associated with pleural effusion. Eur J Radiol. 2006 Aug. 59(2):253-6. [Medline]. Abadir J, Emil S, Nguyen N. Abdominal foregut perforations in children: a 10-year experience. J Pediatr Surg. 2005 Dec. 40(12):1903-7. [Medline]. Polites SF, Habermann EB, Glasgow AE, Zielinski MD. Damage control laparotomy for abdominal trauma in children. Pediatr Surg Int. 2017 May. 33 (5):587-592. [Medline]. Villalobos MA, Hazelton JP, Choron RL, Capano-Wehrle L, Hunter K, Gaughan JP, et al. Caring for critically injured children: An analysis of 56 pediatric damage control laparotomies. J Trauma Acute Care Surg. 2017 May. 82 (5):901-909. [Medline]. Simon RJ, Rabin J, Kuhls D. Impact of increased use of laparoscopy on negative laparotomy rates after penetrating trauma. J Trauma. 2002 Aug. 53(2):297-302; discussion 302. [Medline]. Eichelberger MR, Mangubat EA, Sacco WJ, Bowman LM, Lowenstein AD. Outcome analysis of blunt injury in children. J Trauma. 1988 Aug. 28(8):1109-17. [Medline]. Eichelberger MR, Mangubat EA, Sacco WS, Bowman LM, Lowenstein AD. Comparative outcomes of children and adults suffering blunt trauma. J Trauma. 1988 Apr. 28(4):430-4. [Medline]. Jensen AR, Hughes WB, Grewal H. Secondary abdominal compartment syndrome in children with burns and trauma: a potentially lethal complication. J Burn Care Res. 2006 Mar-Apr. 27(2):242-6. [Medline]. Keller MS. Blunt injury to solid abdominal organs. Semin Pediatr Surg. 2004 May. 13(2):106-11. [Medline]. Keller MS, Stafford PW, Vane DW. Conservative management of pancreatic trauma in children. J Trauma. 1997 Jun. 42(6):1097-100. [Medline]. Navarro O, Babyn PS, Pearl RH. The value of routine follow-up imaging in pediatric blunt liver trauma. Pediatr Radiol. 2000 Aug. 30(8):546-50. [Medline]. Sharpe RP, Nance ML, Stafford PW. Nonoperative management of blunt extrahepatic biliary duct transection in the pediatric patient: case report and review of the literature. J Pediatr Surg. 2002 Nov. 37(11):1612-6. [Medline]. Minarik L, Slim M, Rachlin S, Brudnicki A. Diagnostic imaging in the follow-up of nonoperative management of splenic trauma in children. Pediatr Surg Int. 2002 Sep. 18(5-6):429-31. [Medline]. Nance ML, Mahboubi S, Wickstrom M, Prendergast F, Stafford PW. Pattern of abdominal free fluid following isolated blunt spleen or liver injury in the pediatric patient. J Trauma. 2002 Jan. 52(1):85-7. [Medline]. Davis DH, Localio AR, Stafford PW, Helfaer MA, Durbin DR. Trends in operative management of pediatric splenic injury in a regional trauma system. Pediatrics. 2005 Jan. 115(1):89-94. [Medline]. Dervan LA, King MA, Cuschieri J, Rivara FP, Weiss NS. Pediatric solid organ injury operative interventions and outcomes at Harborview Medical Center, before and after introduction of a solid organ injury pathway for pediatrics. J Trauma Acute Care Surg. 2015 Aug. 79 (2):215-20. [Medline]. Oosterveld MJ, Van Der Kuip M, De Meer K, De Greef HJ, Gemke RJ. Energy expenditure and balance following pediatric intensive care unit admission: a longitudinal study of critically ill children. Pediatr Crit Care Med. 2006 Mar. 7(2):147-53. [Medline]. Levy JB, Baskin LS, Ewalt DH, et al. Nonoperative management of blunt pediatric major renal trauma. Urology. 1993 Oct. 42(4):418-24. [Medline]. Philpott JM, Nance ML, Carr MC, Canning DA, Stafford PW. Ureteral stenting in the management of urinoma after severe blunt renal trauma in children. J Pediatr Surg. 2003 Jul. 38(7):1096-8. [Medline]. Davidson RN, Wall RA. Prevention and management of infections in patients without a spleen. Clin Microbiol Infect. 2001 Dec. 7(12):657-60. [Medline]. Gandhi RR, Keller MS, Schwab CW, Stafford PW. Pediatric splenic injury: pathway to play?. J Pediatr Surg. 1999 Jan. 34(1):55-8; discussion 58-9. [Medline]. Haller JA Jr, Papa P, Drugas G, Colombani P. Nonoperative management of solid organ injuries in children. Is it safe?. Ann Surg. 1994 Jun. 219(6):625-8; discussion 628-31. [Medline]. [Full Text]. Holmes JH 4th, Wiebe DJ, Tataria M, et al. The failure of nonoperative management in pediatric solid organ injury: a multi-institutional experience. J Trauma. 2005 Dec. 59(6):1309-13. [Medline]. Nance ML, Peden GW, Shapiro MB, Kauder DR, Rotondo MF, Schwab CW. Solid viscus injury predicts major hollow viscus injury in blunt abdominal trauma. J Trauma. 1997 Oct. 43(4):618-22; discussion 622-3. [Medline]. Jones VS, Soundappan SV, Cohen RC, et al. Posttraumatic small bowel obstruction in children. J Pediatr Surg. 2007 Aug. 42(8):1386-8. [Medline]. Nance ML, Keller MS, Stafford PW. Predicting hollow visceral injury in the pediatric blunt trauma patient with solid visceral injury. J Pediatr Surg. 2000 Sep. 35(9):1300-3. [Medline]. Durbin DR, Arbogast KB, Moll EK. Seat belt syndrome in children: a case report and review of the literature. Pediatr Emerg Care. 2001 Dec. 17(6):474-7. [Medline]. Santschi M, Echavé V, Laflamme S, McFadden N, Cyr C. Seat-belt injuries in children involved in motor vehicle crashes. Can J Surg. 2005 Oct. 48(5):373-6. [Medline]. Lopez PP, Benjamin R, Cockburn M, et al. Recent trends in the management of combined pancreatoduodenal injuries. Am Surg. 2005 Oct. 71(10):847-52. [Medline]. Shilyansky J, Pearl RH, Kreller M, Sena LM, Babyn PS. Diagnosis and management of duodenal injuries in children. J Pediatr Surg. 1997 Jun. 32(6):880-6. [Medline]. Voss M, Bass DH. 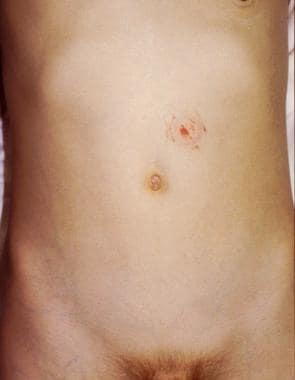 Traumatic duodenal haematoma in children. Injury. 1994 May. 25(4):227-30. [Medline]. Touloukian RJ. Protocol for the nonoperative treatment of obstructing intramural duodenal hematoma during childhood. Am J Surg. 1983 Mar. 145(3):330-4. [Medline]. Moremen JR, Nakayama DK, Ashley DW, Astin M, Nolan TL. Traumatic disruption of the abdominal wall: lap-belt injuries in children. J Pediatr Surg. 2013 Apr. 48(4):e21-4. [Medline]. Computed tomography (CT) image of grade IV splenic laceration from auto-pedestrian accident. Computed tomography (CT) image of grade IV renal laceration from handlebar injury. Reprinted with permission from Pryor JP, Stafford PW, Nance ML. Severe blunt hepatic trauma in children. J Pediatr Surg, 36:7, 2001, Elsevier Science. Computed tomography (CT) image of grade V liver laceration in unrestrained passenger in motor vehicle accident. Abdominal wall findings in passenger who was restrained with only lap belt during motor vehicle accident. Penetrating injury to abdomen from shotgun wound. Volume management algorithm for pediatric trauma patient. *Return to full-contact competitive sports (eg, football, wrestling, hockey, lacrosse, mountain climbing) should be at the discretion of the individual pediatric trauma surgeon. The proposed guidelines for return to unrestricted activity include typical age-appropriate activities. APSA—American Pediatric Surgical Association; CT—computed tomography; ICU—intensive care unit. The authors and editors of Medscape Reference gratefully acknowledge the contributions of previous authors Michael L Nance, MD, Nicolas Lutz, MD, and Perry W Stafford, MD, FACS, FCCM, FAAP, to the development and writing of the source article.